The Solaris solvent protection system for aqueous applications sterilizes your solvent in the bottle via proven UV sterilization and consequently protects all components of your chromatographic system from contamination, including HPLC and light scattering instruments. The solvent pathway is close to the ultraviolet radiation to maximize efficiency. This ensures efficient prevention of microbial growth. Solaris prevents growth of bacteria, fungi or algae with high efficiency and protects your system from down-time due to contamination. It supersedes the use of Sodium-Azide or other preservatives in the chromatography solvent. It saves the danger and effort to handle toxic chemicals. SOLARIS does not only sterilize the solvent after pouring it into the bottle: with its built-in 0.2 µm prefilter it keeps the solution free of biological pathogens like bacteria, fungi or algae. Moreover, it prevents the contamination with particles from the laboratory environment (e.g., dust). Noisy baselines because of bacterial growth are a thing of the past! Solvent (after one week of use) incubated at 30° C for one day. Solvent (after one week of use) incubated at 30° C for seven days. Solaris supersedes the use of sodium azide or other preservatives in the chromatography solvent. This prevents interaction between azide and sample. 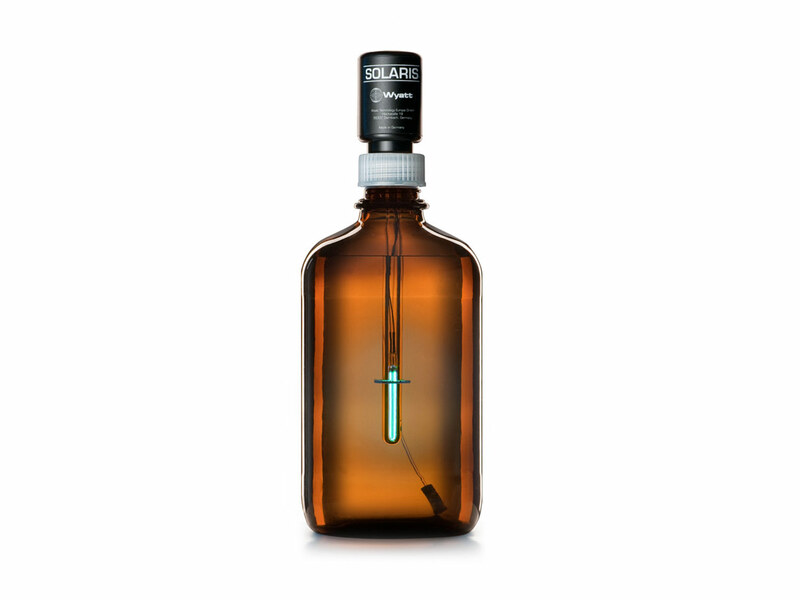 Solaris sterilizes the solvent after filled into the bottle. With its built-in 0.2 μm air intake filter it keeps the solution free of biological pathogens like bacteria, fungi or algae. Moreover, it prevents the contamination with particles from the laboratory environment (e. g. dust). In an idle chromatography system, constant sterilization with Solaris allows recycling of the mobile phase. One batch of solvent is typically stable for up to three days. Saves expense for disposal of solvent waste after the measurements because no toxic chemicals are added. The system comes ready to use and can be mounted on all brown 1-5 L solvent bottles with GL-45 thread. If cleaning is necessary: just rinse with DI water. If you are a current US or Canadian Wyatt Technology customer, you can purchase the Solaris online. Visit the Wyatt Technology Store today!